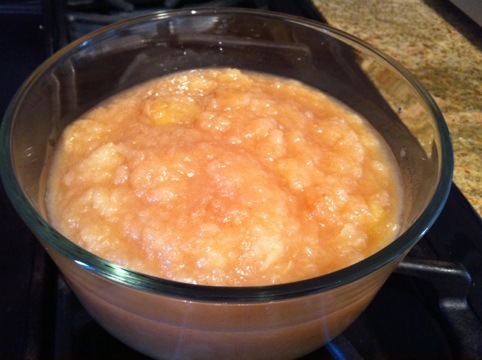 Than this… Honey dappled applesauce using what is likely the last of the CSA apples (one more pick up of shares next week before the big turkey day). I do not understand, any longer, the concept of buying applesauce. This batch didn’t even go through the food processor – just slow cooked on the stove with a dash of freshly ground nutmeg and generous sprinklings of cinnamon. Normally I’d have cinnamon sticks on hand but they have been ghastly expensive when I’ve seen them in the store lately (at Foodtown anyway). Anyone else noticing this? I’m wondering if anyone in the grocery industry can tell us if certain foodstuffs increase just in time for Thanksgiving. QUESTION: Do grocery stores raise the price of cinnamon sticks and other holiday specific items this time of year? Are there any rules against it (like treating it as a form of price gouging)? Go ahead, gimme the dirt! Btw, just looked online and Foodtown is listing a .75 oz. container of cinnamon sticks at $6.99 (that’s two lattes!!!!). Spice Supreme comes in significantly less at $1.19 for a 1.5 oz. package, as does Badia with their price point at $1.99 for a 1.25 oz. container. Assuming someone’s at fault, maybe it’s not the grocery stores but the companies themselves involved in taking advantage of the holiday cheer? Hey, Revel, I wouldn’t be a bit surprised if prices get raised during periods of peak demand. It’s like gasoline jacks up just as summer rolls around. Haven’t you noticed? You might want to check out Sahidi groceries on Atlantic Ave. near Brooklyn Heights. I went to their website but didn’t find a way to search for specific items. Still, it’s an experience even if you don’t find an incredible deal on cinnamon sticks. It’s a middle eastern grocery where much of the stock is sold in bulk from bins and barrels. When I lived nearby back in the ’70s (behind the store, not in the Heights! ), the prices were fantastic bargains. The store even smells incredible, with all the coffee, spices, etc., mingling into a wonderfully memorable scent. There are (or at least were) several decent middle eastern restaurants in the area (and their price was right), as well as other interesting shopping, the Promenade, etc., in case you want to make a family day of it. Hey Susan, I LOVE Sahadi’s! Their prices really are very reasonable, and the experience is something else. I have not checked out restaurants in the area lately and am long overdue to do so. Maybe we could lunch near there next time you’re in town! I haven’t been there for a while, but Sahadi is a great store, big selection, low prices. Check out a piece of freshly cut halvah too. It was Saturday, a nice day by recent standards. Looking up at the sky, it was deep blue accented with some fluffy white clouds. Standing in the yard enjoying the sun’s heat you couldn’t help but notice it was also quiet, quieter than usual for Saturday afternoon. I slowly walked through the grass and clover looking for something good to eat. The process was slow since this was all taking place in the wild overgrown part of the garden. Anything goes in that area so long as it doesn’t hurt the cultivated section. Slowly, methodically moving through the brush, step.. pause, step… pause, all the time looking side to side, occasionally behind for some ‘easy pickin’s’. While technically a garden, this year there wasn’t a whole lot of garden going on. Weeds Rule! Step… pause, step … pause- suddenly there were some loud crackling noises off in the distance. I froze in my tracks turning my head toward the sound. Motionless for what seemed like hours I started my search for food again, this time making random pauses to listen for anything nearby. As it turned out, I didn’t have to wait long before there was a roar. In fact a series of five, each sounding louder and more frightening than the ones before. The sky started getting dark, tree pieces were blowing in the gusts of wind. More noise, more wind, pieces of trees blowing into the air. I could hear their faint screams, thousands of them all around me as they got pulled up off the ground never to be seen again. Once uprooted they just flew upward disappearing into the pitch black sky, their screams being drowned out by that roar from hell. Well, that’s what I imagined happening down on the ground, a bug’s eye view of my mowing the lawn down for mulch. I put cardboard over the planting area and things will stay that way until the tree has no leaves left to fall. Has anyone started their garden’s seasonal clean up yet?